Twenty years ago, on Halloween night in Los Angeles, the charismatic young film star River Phoenix died on a sidewalk outside of The Viper Room. It was a strange and shocking drug-fueled ending to an amazing young man’s life. I was about the same age as River and I had sincerely loved a couple of his movies (Running On Empty, Stand By Me, Dogfight). I thought he was cool and vulnerable, much deeper than a lot of his acting contemporaries. My friends did too. We were living in a big house in SE Portland, down the street from Dot’s Cafe–a rotating mix of me, Martha, Stephen, Vince, Laural, Michael, and maybe one or two others. I remember a record player in the front room with a bunch of records nearby, though we mostly played Nirvana, Unwound, Gang of Four, Crackerbash, and Galaxie 500. When we heard that River had died, we wanted to do something special to mark the occasion. At the time, there were two open mics in Portland where we hung out–Cafe Lena and Jiffy Squid. Sometimes we would sign up for the open mic and then read each others poems–shenanigans like that. So we decided to write poems about River. But we didn’t read them at an open mic. We wanted to print them up and distribute them. I was a couple of years into doing Future Tense at the time, so I thought it would be cool to mark this death as the start of a new publication. 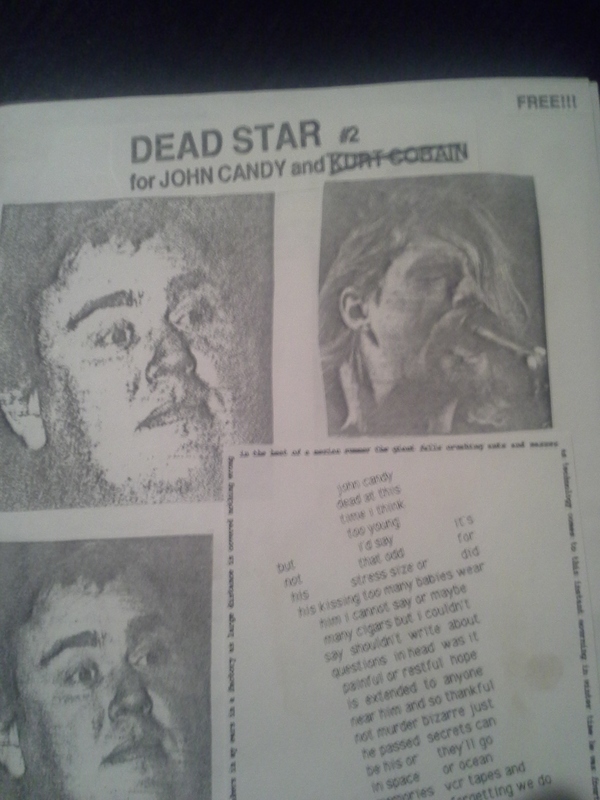 A zine called Dead Star. 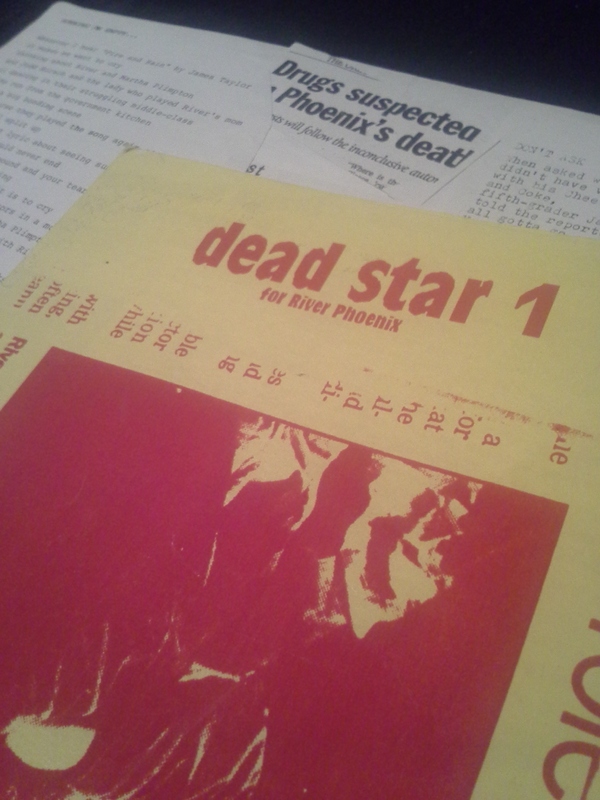 The first issue of Dead Star (for River). Notice the original layout underneath. Here’s how it would work: When someone interesting and famous died, I would call a bunch of poet/writer friends and ask them if they wanted to write something. If they were able to write something THAT DAY they would call me back and I’d run over to their house and pick it up. Yes, this was before the Internet and email (and cell phones) were everywhere. I had to drive to get stuff! Then I would cut and paste the layout (1 page–front and back, folded) and go print up about 200 copies. I’d cruise around and drop off stacks at places like Ozone Records, Cinema 21, Powell’s, X-Ray Cafe, and Umbra Penumbra. Issues of the zine would be out before many people even knew the person had died. It was like breaking news. Even before Internet buzz, Dead Star was noticed quickly. It was mentioned in Factsheet Five and a couple of other places and I started getting mail. In the next couple of years, we put out subsequent issues for John Candy (issue #2)*, Charles Bukowski (#3), John Wayne Gacy (#4), and Elizabeth Montgomery (#5)**. I eventually got too busy to keep doing it (the arrival of baby Zach, other things to publish, working at the espresso cart my girlfriend and I owned). 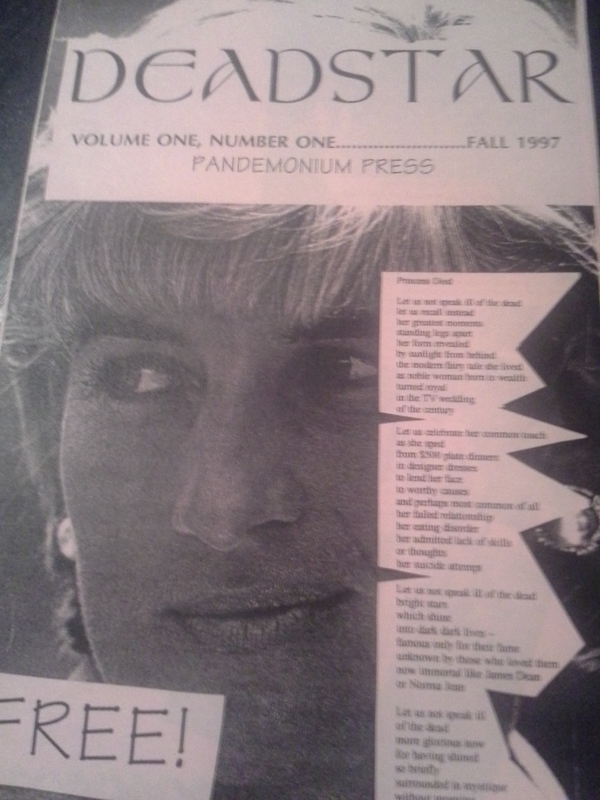 My friend, Jeff Meyers, resurrected it for one issue (for Princess Diana) in 1997 before fading away. John Candy died on the day that Kurt Cobain had first attempted suicide (and nearly succeeded). As a bad joke, we put his name on this issue as well, but crossed it out… when he came back alive! The comeback that didn’t last. Dead Star was an interesting thing to do. Some of the poems (or flash fictions or mini essay things) were sweet, sometimes a little sour. Even sarcastic at times. If I didn’t care for a piece that was submitted, I didn’t use it, but mostly I didn’t really enforce any editorial bias or mood. Dead Star was an open forum. While some people thought it was distasteful (I recall Walt Curtis, of all people, giving me grief about it), many others were entertained. I probably got more mail about Dead Star than anything else I was doing at the time. I think I met Melody Owen through Dead Star, and also Sean Tejaratchi (who invited me to his office to scavenge for clip art, a year before he published the first issue of his famous zine, Craphound). 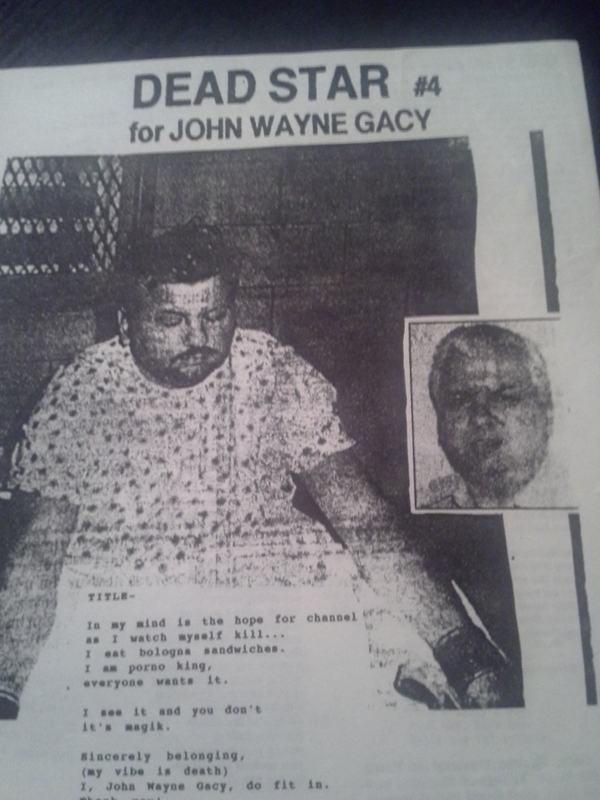 The John Wayne Gacy issue was pretty creepy (and sort of a cheat, since we knew he was about to executed). For a while now, I have thought about restarting it again, as a web site. It seems like it would be a good timely thing. For instance, right now people could be submitting poems about Lou Reed (loved that dude). If anyone wants to design a site and help me restart it, get in touch with me. As if I didn’t have enough to do. Have a happy Halloween and glorious Day of the Dead. *I was pretty proud of the story I wrote for the John Candy issue. 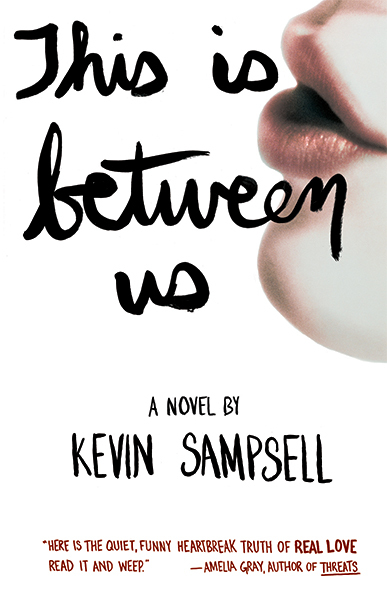 It was a flash fiction called “Candy John” and it reappeared in my first collection, How to Lose Your Mind With the Lights On. **I couldn’t find any copies of the Bukowski or Montgomery issues, or I would have shown images of those as well. This entry was posted in Uncategorized and tagged Cut and Paste layout, Dead Star, death, Factsheet Five, John Candy, John Wayne Gacy, Melody Owen, portland, pre-Internet, River Phoenix, Sean Tejaratchi, Zines. Bookmark the permalink.